Based in Switzerland, Audemars Piguet is the oldest fine watchmaking manufacturer still in the hands of its founding families (Audemars and Piguet). 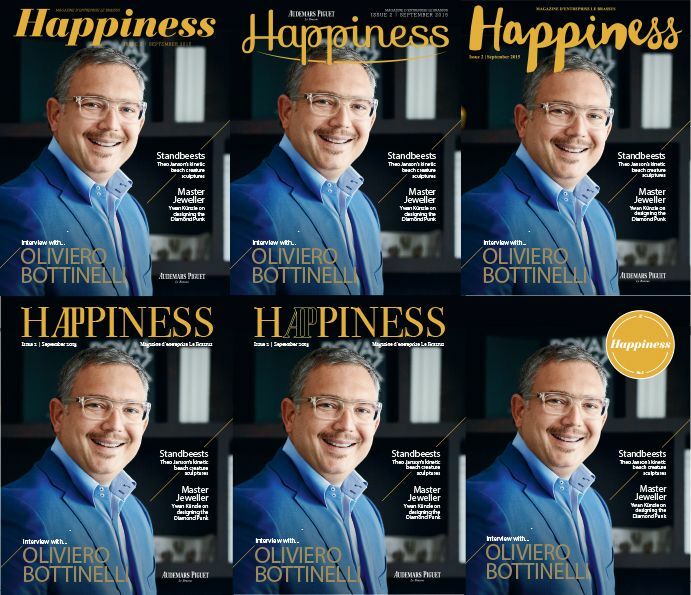 Following a competitive pitch, Audemars Piguet appointed Completely Creative to create their corporate magazine 'happiness'. We were to devise the art direction, magazine structure and design style, and implement a production process which would involve working with teams in Switzerland to deliver the final magazine in English and French. The magazine would be published 3-4 times a year and distributed to every colleague across the globe. Examples of alternatives explored for the masthead design. The CEO's fondness for Star Wars influenced the naming of the happiness magazine colour palette. Our approach was to develop an art direction style that would both reflect the high quality of the brand, as well as reflecting the spirit, energy and commitment of all the teams who come together to create the watches the company is renowned for. It would communicate and reinforce the company’s inherent qualities and values, engendering team spirit, commitment and passion while celebrating the brand’s unparalleled history. "It was crucial to have a strong intellectual partnership with the completely creative team. They quickly understood our brand and challenges, helping us design a communications tool that is compelling, engaging and already seen as industry best practice!" We developed a magazine format that featured a number of distinct sections, each presenting a different aspect of the business. In-depth team articles and individual profiles help give colleagues across the company an understanding of the roles that each team plays as well as an insight into the production process. Alongside this, feature articles would focus on key developments and events. Regular news and employee achievements would feature at the end of the magazine. A high degree of co-ordination was required, working with the clients partner agencies in Switzerland across image and print production. The magazine has now been in circulation for more than 2 years and distributed across the globe. There has been very positive employee engagement and the magazine is seen as a leading example within the industry. Yunus Shaikh, Creative Director comments: "The team really stepped up to the challenge of creating an engaging magazine style which could be developed and evolved as each issue was created." Need help with your next magazine project?